The Sachtler Ace Matte Box features a reversible 15mm rod bridge that allows you to mount the matte box on rigs with both large and small diameter lenses. The rod bridge can be screwed on right-side up or upside-down to provide either 3.3 or 4.3" of distance between the center of the support rod to the center of the rear clamping interface. Once mounted, it secures with just a single lever. Box Dimensions (LxWxH) 14.646 x 9.291 x 6.221"
Ace Matte Box is rated 3.7 out of 5 by 3. Rated 5 out of 5 by Anthony from Solid build, great design This is the sturdiest matt box I've seen. All rigid ABS plastic. The flags stay put with one knob to tighten or remove. But, the side flags are one piece so they can't be reduced in height to fold in. You have to remove them for storage. No big deal due to the one knob design. Rated 3 out of 5 by Mike S from Update: Wooden Camera univeral cloth donut fits Nothing to retract about my previous review, those darn little plastic buttons still rattle. However new is that the Wooden Camera universal cloth donut which I ordered from B&H fit the Sachtler Ace Matte Box perfectly. Although the Sachtler specifications curiously don't state it, the Ace Matte Box does have a standard 143mm donut clamp. The universal cloth donut is an essential accessory for adapting Cine-Mod photo lenses, like the Nikkor AIs and Zeiss ZF lenses I am using via an adapter. The cloth donut allows you to fit the matte box to a lens shade or simple 77mm filter adapter or simply the lens barrel as you see fit, and to take up the slack as you focus the lens and the lens breathes. The combination of equipment looks good like it was designed to be together. Vintec! Sachtler! Why don't you provide an accessory like this, preferably at no extra cost with your expensive-enough Matte Box? If I would buy another Matte Box, I would look carefully at the nice, more expensive one from Wooden Camera. Rated 3 out of 5 by Mike S from Nice overall, has a rattle I use this with other Ace accessories such as the Follow Focus and Base Plate. It was not clear to me initially that the base of the Matte Box could be reversed to extend its height 1 extra above the rods, but this is a very useful feature. I am discovering more about it since having it for awhile, the most important one is that the filter holder release buttons very much rattle, which is a major issue and why I rate it as low as I do. These plastic, spring-tensioned buttons are on the matte box proper and only rattle when the filter holders are inserted, with the filter holders removed the spring presses them tightly. Many other features are excellent, such as the strong plastic construction to keep weight down, and the nice design of the flags. One other thing to know is that in case you are using them with a DSLR or mirrorless camera with prime lenses, you probably need a universal cloth donut from another manufacturer. I currently have one on order and will try this out. 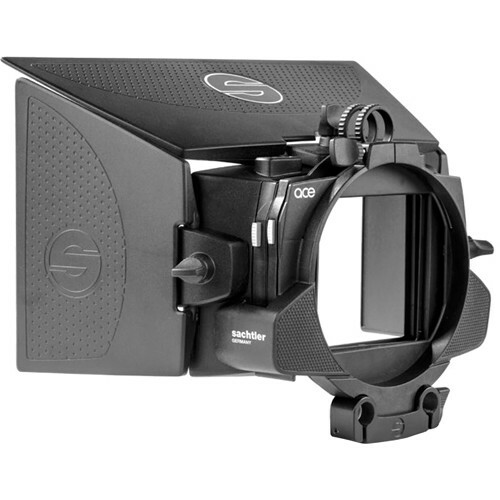 The matte box has a 143mm clamp, which is a standard size. The standard donuts supplied will probably not work for you in this case. Overall, if I had known about the rattle, I maybe would not have bought this unit and spent more money on a more professional matte box. How can the height be adjusted? Can you adjust distance from rods to center of lens? No, it is fixed at the standard height for matte boxes. Shape and Zacuto offer base plates which will allow the rods to go up and down if you need to centre the lens for a particular camera. In my case, I bought a riser plate from Vocas to ensure the camera was at the right height for this matte box. It's the best matte box for the money hands down on the market. But you need to buy the Movcam nun's nickers which fits this matte boxe perfectly at 144mm I believe. The rubber pads to block the light from the back that Sachler offers with this are awful. Lamparte Bridge plate should work also but I have not tried it. I bought the Shape solution which is the most expensive but it is excellent, Zacuto looks great.